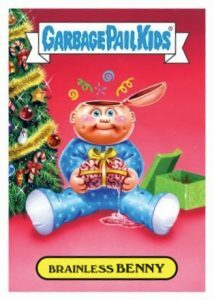 Chopping through the holidays with another GPK parody effort, 2016 Topps Garbage Pail Kids Christmas is not just limited to the standard Santa Claus satire. 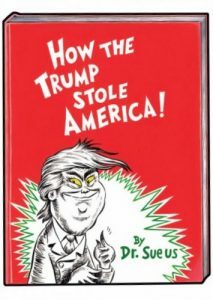 Donald Trump again remains in the crosshairs in the sticker set that mixes both timely and timeless Christmas-based humor. 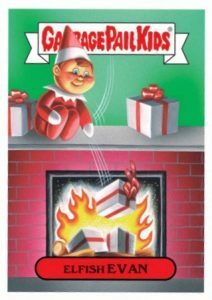 Consisting of 13 cards in the limited-time set, 2016 Topps Garbage Pail Kids Christmas is available directly from Topps for one week. After that, the cards are printed and issued and final totals are made known. 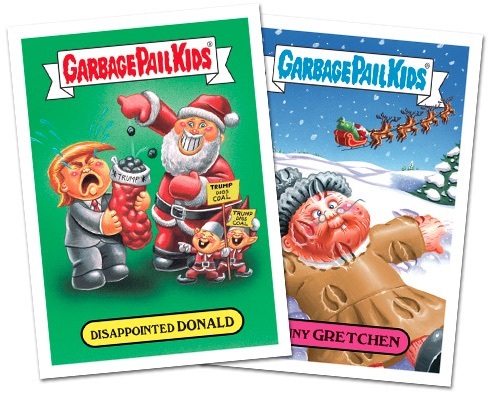 Collectors can obtain the full 2016 Topps Garbage Pail Kids Christmas set for $34.99 or individual sticker groups for $9.99. While most come with the A and B version that includes a second caption on the same image, card #7 is a solo affair. 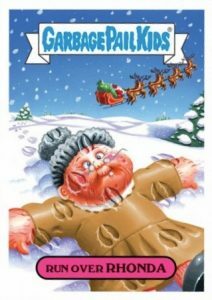 This card also strays from the GPK brand and instead operates with a Wacky Packages theme. 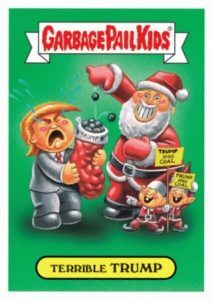 2016 Topps Garbage Pail Kids GPK #2a and 2b Christmas Stickers - Stocking Mint! 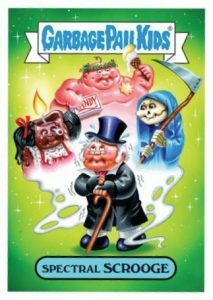 2016 Topps Garbage Pail Kids GPK #5a and 5b Christmas Stickers Grandma Mint! 13 cards. 2 cards for each design. Card #7 only has 1 version. Shop for cards on Topps. Available at Topps.com until 12/27/2016 at Noon EST.